What if a well-known witch with more than twenty years of experience in witchcraft and more than fifty-three covens in her Clan allowed readers to take a peek inside her own personal notebooks, her own path, revealing what magic worked and what didn’t? In this book, the author, who has written numerous books on witchcraft, including Solitary Witch: The Ultimate Book of Shadows for the New Generation, does just that, and more. 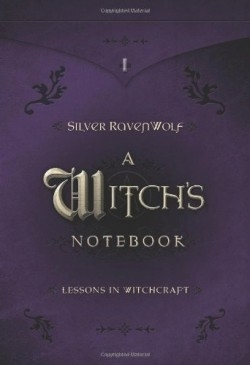 With her signature wry sense of humor (she declares that witches need to periodically “dust bust our energy field”), Ravenwolf opens up her notebooks and not only shows the successful techniques she has used in the process of living a magical life, she also points to where this may ultimately lead: to enlightenment. Enlightened witches? Well, anyone who has seen the movie What the Bleep Do We Know will recognize the blending of the magic of Quantum Physics into the ways in which people create their own realities, moment by moment. Unlike movie or television witchcraft, true witchcraft is the “art of changing consciousness at will” and this is the very essence of the practice of meditation and many of the yogic paths. Ravenwolf demonstrates one step toward a blend of witchcraft and other “new age/new physics” approaches to enlightenment in a section on letting “Spirit show the way.” A witch who feels overwhelmed will find a way to gain assistance in this exercise. To get past the negative spin of overwhelm, the author tells readers to write down all the things they have to do, without worrying or prioritizing. The spell includes rolled quartz stones—as many as there are tasks on the list—as well as other elements to energize the spell. The witch allows Spirit to choose the order of accomplishment. In another section titled “As Above, so Below,” the author instructs how to prepare “incense prayer papers,” blending a witch’s spell into the Victorian custom of making petitions to God on strips of paper. The witch’s prayer papers are dipped in a mixture of magical spring water, saltpeter (so they smolder, rather than flash-burn) and essential oils. The witch writes a prayer on the dried paper and lights it. “The essential oil aroma drifts around the sacred area,” says Ravenwolf, sending the prayers into the air itself. She goes on to dissect the rose spell, root out its origins, the symbolic elements in it, and how each element relates to the techniques she has built upon in the book’s first four lessons. In fact, the author urges practitioners of witchcraft to do this with all the spells they use: to analyze and research the origins, to pick the spells apart, especially spells that “did not work in the way that you had planned.” In doing this, the witch may be able to identify elements in the spell that indicate why it did not function as intended. Readers who are new to witchcraft as well as more advanced practitioners will find much to contemplate in this earthy, practical, and rich guide to the essentials of the witch’s path. The author points out that the book is “designed as a hands-on work and does not cover a vast array of explanation,” and she suggests that beginners may want to find books on witchcraft that will enhance their understanding of her lessons. However, the concept of “Beginner’s Mind” mentioned by Chogyam Trungpa in Shambala, The Sacred Path of the Warrior also applies here. The reader who is new to witchcraft may be even more open to the author’s lessons than a witch who has faithfully followed a particular tradition.